Cooking a Steak on a Smoker Cooker! This 3-inch boneless ribeye steak was the perfect thickness to cook on a smoker cooker. We used a dry brine and a rub from Meathead Goldwyn of Amazing Ribs (check out all the details of rub recipe here). Ever want to cook a steak on your smoker cooker? If you have a thick cut steak like this 3-inch rib eye you can cook it Fast & Hot. Two-hours is “Fast” in the smoker cooker community, and 275º Fahrenheit is in the “Hot” Barbeque setting on the Lang smoker gauge. Smoked boneless beef ribeye steak. Use the Big Bad Beef Rub by By Meathead Goldwyn. One three-inch ribeye steak will feed two people. Dry Brine your ribeye with Kosher salt 1 to 24 hours prior to smoking. 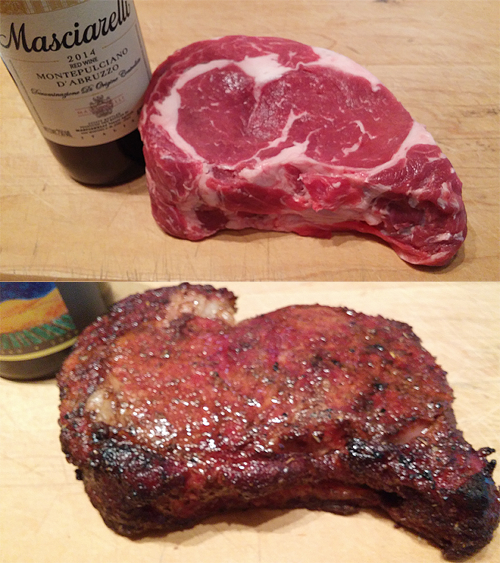 This entry was posted in Meat and tagged ribeye steak, smoked ribeye by . Bookmark the permalink. Smoke recipes are really difficult to find especially a good one is the hardest task. But finally, I have found something great. Happy to read this Blog!.